Prepare the chamomile infusion. In a small saucepan, combine 1/2 cup water, wine, sugar and chamomile. Set over medium heat and bring to a boil, stirring to dissolve the sugar. Remove from the heat, cover and steep for 15 minutes. Strain. Make the sabayon. Set up a double boiler: Fill a large (4-quart) saucepan with 1-inch of water and choose a 3 quart stainless steel bowl that you can nestle into the pan without touching the water. Bring the water to a boil over high heat. Whisk the egg yolks in the 3-quart bowl. Slowly add the chamomile syrup into the eggs, whisking constantly, until thoroughly combined. Reduce the temperature under the pot of boiling water to maintain a gentle simmer. Set the bowl with the egg mixture over the simmering water and whisk constantly until thick and frothy, about 8 minutes. Remove the bowl from the heat and stir in the mezcal/tequila. Finish the dish. Arrange three slices of mango on each of 6 dessert plates. 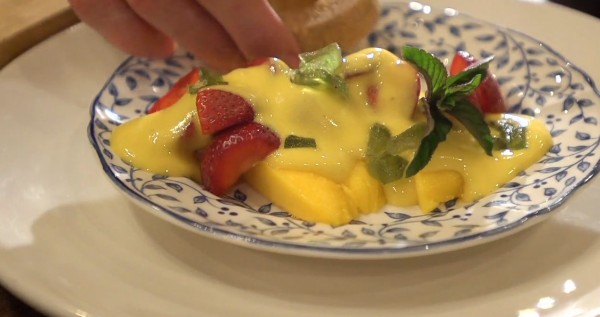 Scatter the strawberries over the mango. Spoon the sabayon over the fruit. Sprinkle on the candied orange and prickly pear. Garnish with the top of a sprig of mint and serve immediately. This looks great! Question-can the sabayon be made ahead of time?